INFO: A group of about 7 - 12 artists of mixed abilities working with a portrait​ model. Summer term 24 April, 08, 22 May. 05, 19 June, 03 July. How would you like to help out by sitting for a portrait? The group is always looking for new, willing sitters. Contact Peter Herdson via the contact form for more information. A mixed ability painting group. Summer term 25th April to 18th July. DATE/TIME: Thursdays Mornings - 10:00am - 12:30pm. PRICE: The price changes each term depending on student numbers but is usually not more than £120 for the term. The current Spring term was £100 because we have a full compliment of attendees. The Summer term, which is now full, will be £105. There may be available spaces when members are unable to attend. 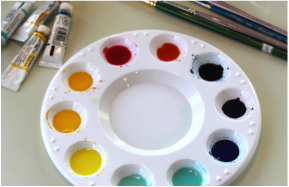 INFO: We normally use acrylics but a wide variety of media and methods are demonstrated, from acrylics, inks, charcoal, pastel, collage and watercolour. Summer term 2nd May to 18 July, No class 30th May and 4th July. All at the Methodist Church Hall, High Street, Maidenhead usually Mondays beginning at 7.30pm (unless otherwise shown). 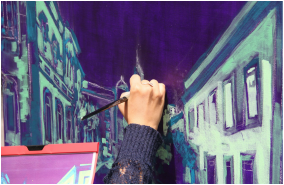 These sessions provide opportunities to meet up with other members of the club and paint together in the sunshine but be prepared for painting in all weathers. Hats with brims can sometimes be more useful than sunglasses.. You will need to arrange your own transport to the venue. 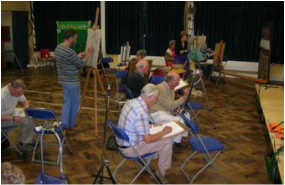 Don't worry if its your first time - bring along just a few sketching materials or a small case of watercolours and a light-weight deck chair or stool and water to paint and have fun! Members often have difficulty in locating others on arriving at the site. Where necessary a meeting point is indicated where early arrivals can wait until others arrive and perhaps leave a note for later arrivals. The gardens are to the south side of the house and originally extended down to a ha-ha from where one could view the Hall Barn Estate. The main elements of the garden have been preserved/restored and consist of a parterre, a long walk to the orchard and kitchen garden. The present owners have also added a natural swimming pond which relates to the orangery built in 2007 where the swimming area is bordered by many pond plants including rushes. Other features include a Bog Garden, a ‘green roof’ and a Japanese Garden. Hall Barn Gardens are listed on the county register of gardens of particular historical interest.